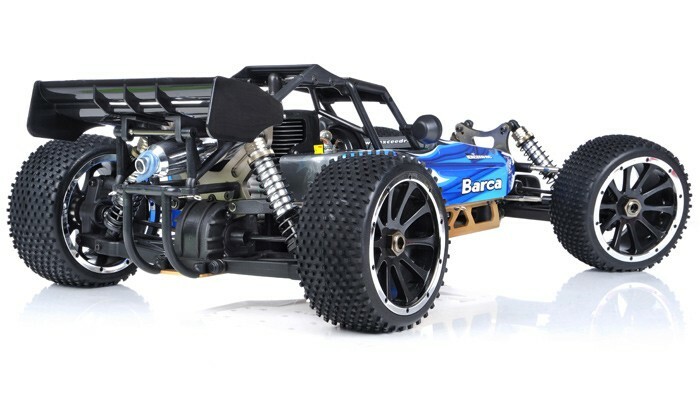 The RTR Exceed RC Barca is one of the fastest 1/5Th Scale Buggy on the market. 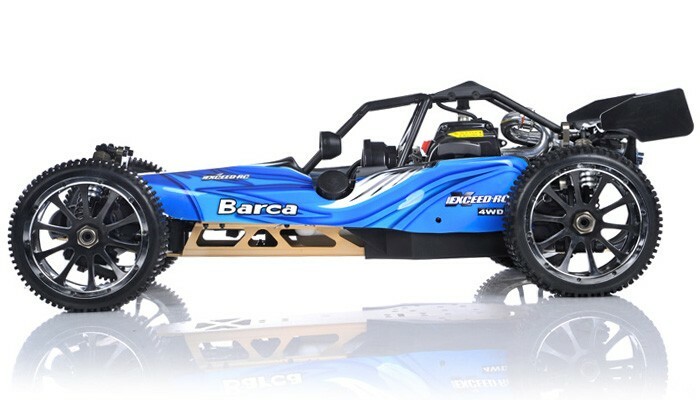 That's right, we've raised the bar with Exceed RC new line of 5th Scale GP Cars!!. The Exceed RC Barca has enough power to do a lot of bashing, and jumps. 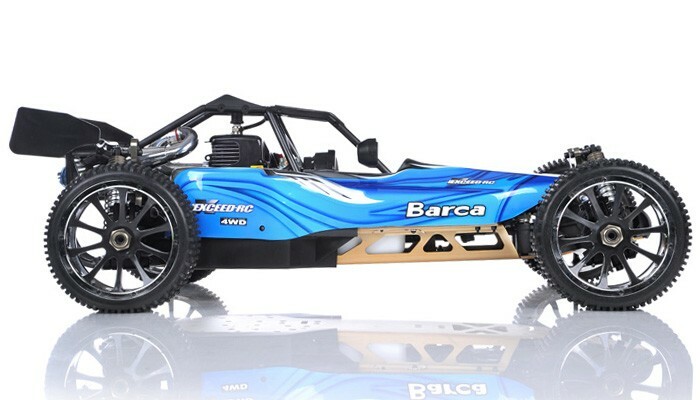 A huge list of performance and durability upgrades come standard in the RTR Barca, so you know that you've got a buggy that can handle extreme off-road driving. High quality main diff/ gears. 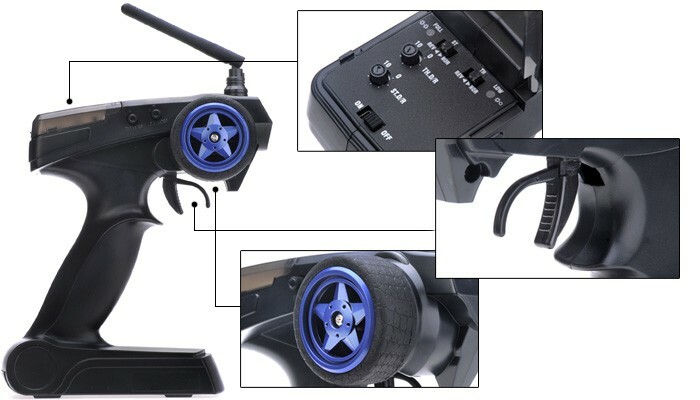 Four wheel centre drive system, solid universal joint cups, high performance full ball bearing. Fiberglass brake disc provides quick brake response under high temperature. Wheel rim is assembled and secured by 24 screws enable the tire and wheel rim are not separated while high speed running. Fold stylish and solid full anodized aluminum chassis. New design solid roll cage protects the inner instruction perfectly. Perfect design and extra width front/rear suspension arm. Powerful engine system with air filter. Full aluminum polished exhaust pipe. 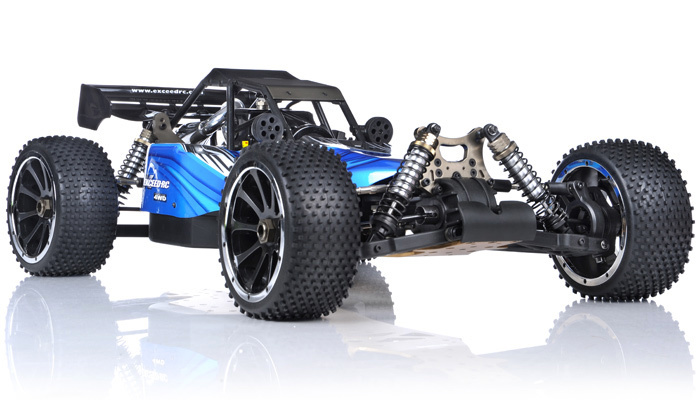 Enhanced suspension arm system, solid front/rear shock tower. High quality unleaded Gasoline + Stroke oil mixture to start your engine. 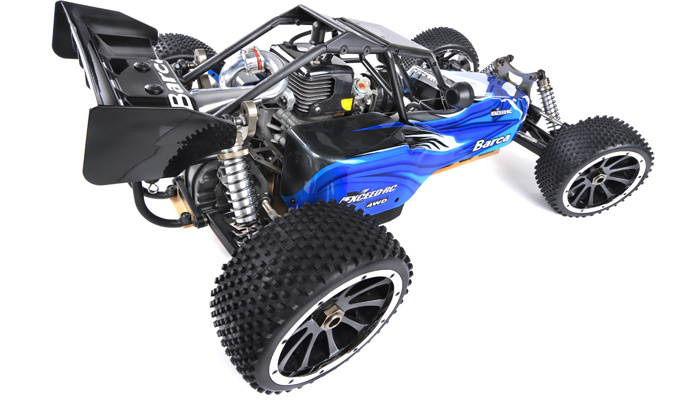 The RTR Exceed RC Barca is completely pre-built and ready to go right out of the box! Everything is assembled and tuned for you by professionals - diffs, slipper clutch, shocks and more are perfect before you even open the kit and with all the top of the line equipements already installed, you don't have to do a thing to get going fast! 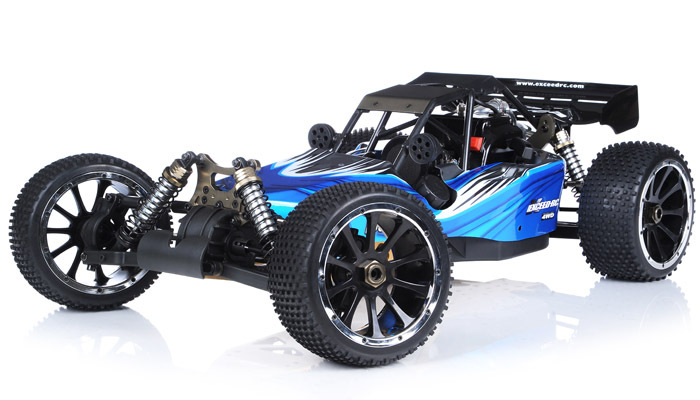 quality that you'd expect from a high end model car kit but with the added convenience of being factory pre-assembled to the highest standards - giving you a high performance RC car straight from the box! 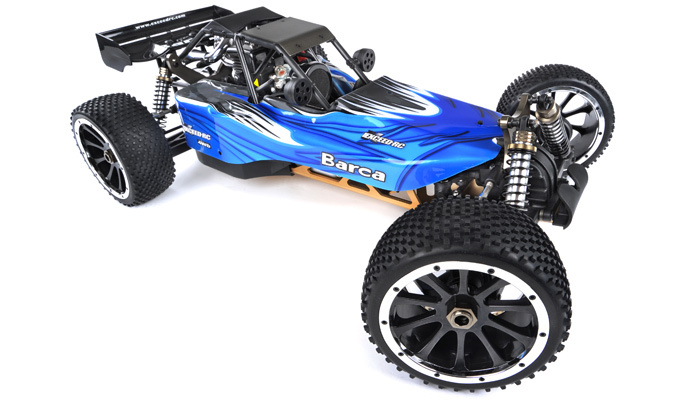 Exceed RC Barca are 98% factory assembled - they come Ready-To-Run and equipped with all the radio gear required. Just a few steps are needed to get your car up and running, such as adding the batteries to the transmitter and receiver, and breaking in the engine. 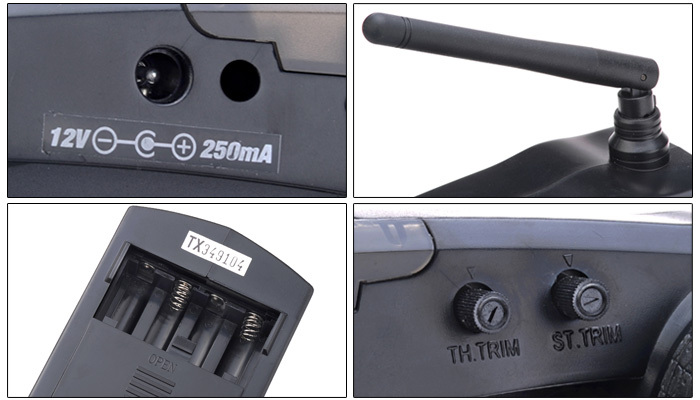 A high quality super narrowband 2.4Ghz is the new advanced "pistol grip" radio set is included for excellent range and precise control over the steering, throttle and braking.